“Do these mysterious stones mark the site of the Garden of Eden?” asks Britain’s Daily Mail. I thought it was an odd choice to present this discovery of an early human sacred site in such a definitive biblical way. A Kurdish shepherd uncovers Gobleki Temple, a Turkish Stonehenge. From the Wall Street Journal: Mexican gardeners not losing as much work as their paisa cousins in construction and other trades. Wait until water rationing goes into effect. Many Immigrants Still Till the Land of Opportunity. Remember the Orange Revolution? Unrest grows in the Ukraine, the economy is on the verge of collpase. Our economy is too but folks here can’t be bothered, they’re too busy watching TMZ. Unrest in Ukraine appears on the rise. Tomorrow and Wednesday, the greatest living Gitano Flamenco family, Los Farruco will be performing right here in Los Angeles. They are sure to bring the house down. See here for more details and info on half price tickets. 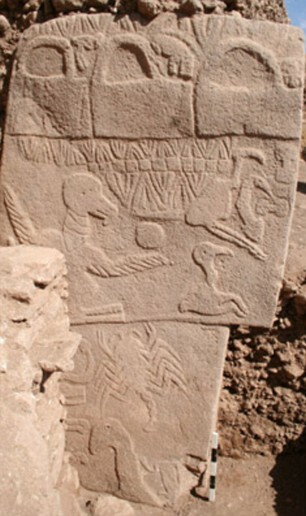 Wow…that story about Gobekli Tepe is amazing, but it gets thoroughly annoying with the over-reaching connections to the Garden of Eden. I also think the Flight of the Conchords aren’t funny. NOT! I love every bit of it, from the 1st season to the current season. Different strokes for different folks. And I often tell the kids at my work how amazing certain things are but they don’t care. They won’t ever care. Man, this train of thought is making me feel old.